I painted a 70 El Camino for this fine nova.It was hit in the right front and needed suspension work.It had a hot V-8 and 4spd. trans.I never drove it but the guy I sold it to said it was FAST. I painted this when I first opened my shop in Oregon.The owner of this car was a car dealer, I got many nice rides from him. This was a favorite of mine. I got it in a trade (painted a 64 Impala). I had my friend Todd Wooward do the upholstery in a black vinyl. I put a jazzy red paint job on it and drove it around for about a month. It was parked out in front of my shop and some guy from Alaska needed it more than me. I liked the money but I miss the car. This Mustang was a car the customer prepped out for me. I charged $200 to shoot it.I think I charged a little more because I buffed it out,it was a long time ago. 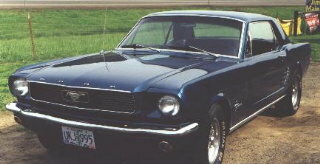 This pic was taken when I repaired a scratch in april of 2000. This was a fun car to drive.I felt like Steve Mc Queen in the movie" Bullet" when I would drive home.The sound, speed and the way it handled.......great!I didn't like the color the person picked out when I sold it (I sold it with a paint job) oh well he bought it. 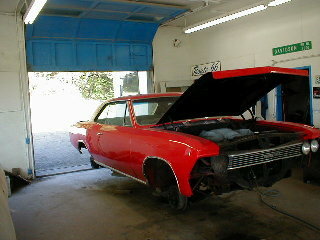 My 66 Chevelle , I was detailing inside the wheel wells and putting on chrome. 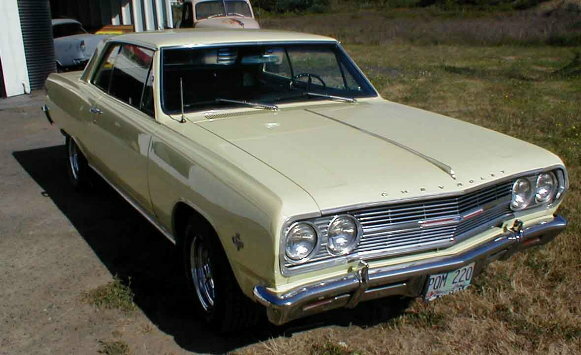 A 65 Malibu I had the summer of 01. I painted it then drove it for a few weeks then sold it. It was a clean car.